Who benefits from online marking of NAPLAN writing? In 2018 most students in most schools will move to an online environment for NAPLAN. This means that students will complete all test sections on a computer or tablet. Test data that is entirely digital can be turned around more rapidly so that results will be available for schools, systems and families much faster. The implication is that the results can be put to use to assist students with their learning, and teachers with their planning. While this appears to address one of the persistent criticisms of NAPLAN – the lag between testing and results – other questions still need to be asked about NAPLAN. Continuing concerns include high stakes contexts and perverse effects (Lingard, Thompson & Sellar, 2016), the marketization of schooling (Ragusa & Bousfueld, 2017), the hijacking of curriculum (Polesel, Rice & Dulfer, 2014) and the questionable value of NAPLAN for deep learning (beyond test performance). Almost ten years after its introduction, NAPLAN has been normalised in Australian schooling. Despite some tweaking around the edges, the original assessment architecture remains intact. However, the move to online delivery and automated marking represents a seismic shift that demands urgent attention. Most student responses in NAPLAN are closed questions. In the new online format these include multiple choice, checkbox, drag and drop, reordering of lists, hot text, lines that can be drawn with a cursor and short answer text boxes. These types of answers are easily scored by optical recognition software, and have been since NAPLAN was introduced. However the NAPLAN writing task, requiring students to produce an extended original essay in response to an unseen prompt, has always been marked by trained human markers. Markers apply a detailed 10 point rubric addressing: audience, text structure, ideas, persuasive devices, vocabulary, cohesion, paragraphing, sentence structure, punctuation and spelling. In years when narrative writing is allocated, the first four criteria differ however the remaining six remain the same. Scores are allocated for each criterion, using an analytic marking approach which assumes that writing can be effectively evaluated in terms of its separate components. It is important to stress that online marking by trained and highly experienced teachers is already a feature of high stakes assessment in Australia. In NSW, for example, HSC exams are marked by teachers via an online secure portal according to HSC rubrics. The professional learning that teachers experience through their involvement in such processes is highly valued, with the capacity to enhance their teaching of HSC writing in their own schools. Moving to online marking (called AES or Automated Essay Scoring by ACARA, also called machine-marking, computer marking or robo-marking) as NAPLAN proposes is completely different from online marking by teachers. While the rubric will remain the same, judgement of all these criteria will be determined by algorithms, pre-programmed into software developed by Pearson, the vendor who was granted the contract. Algorithms cannot “read” for sense, style, context or overall effectiveness in the ways that human experts can. All they can do is count, match patterns, and apply proxy measures to estimate writing complexity. ACARA’s in-house research (ACARA NASOP Research Team, 2015) insists on the validity and reliability of the software. However, a recent external evaluation of ACARA’s Report is scathing. The evaluation (Perelman, 2017), commissioned by the NSW Teachers’ Federation from a prominent US expert, argues that ACARA’s research is poorly designed and executed. ACARA would not supply the data or software to Perelman for independent examination. However it is clear that AES cannot assess key aspects of writing including audience, ideas and logic. It is least effective for analytic marking (the NAPLAN approach). It may be biased against some linguistic groups. It can easily be distorted by rewarding “verbose high scoring gibberish” (Perelman, 2017, 6). The quality of data available to teachers is unlikely to improve and may lead to perverse effects as students learn to write for robots. The risk of ‘gaming’ the test is likely to be higher than ever, and ‘teaching to the test’ will take on a whole new dimension. Human input has been used in ACARA’s testing of AES in order to train and calibrate the software and in the future will be limited to reviewing scripts that are ‘red-flagged’ by the software. In 2018 ACARA plans to use both human and auto-marking, and to eliminate humans almost entirely from the marking process by 2019. In effect, this means that evaluation of writing quality will be hidden in a ‘black box’ which is poorly understood and kept at a distance from educational stakeholders. The major commercial beneficiary, Pearson, is the largest edu-business in the world. Educational assessment in the UK, US and now Australia is central to its core business. Details of the contract and increased profits that will flow from the Australian government to Pearson from the automated marking of writing are not publicly available. Pearson has already been involved in NAPLAN, as several states contracted Pearson to recruit and train NAPLAN markers. Pearson have been described as a “vector of privatisation” (Hogan, 2016, 96) in Australian education, an example of the blurring of social good and private profit, and the shifting of expertise from educators and researchers to corporations. Writing is one of the most complex areas of learning in schools. NAPLAN results show that it is the most difficult domain for schools to improve. Despite the data that schools already have, writing results have flatlined through the NAPLAN decade. Negative effects and equity gaps have worsened in the secondary years. The pattern of “negative accelerating change” (Wyatt-Smith & Jackson, 2016, 233) in NAPLAN writing requires a sharper focus on writer standards and greater support for teacher professional learning. What will not be beneficial will be furthering narrowing the scope of what can be recognised as effective writing, artfully designed and shaped for real audiences and purposes in the real world. NAPLAN writing criteria have been criticised as overly prescriptive, so that student narratives demonstrating creativity and originality (Caldwell & White, 2016) )are penalised, and English classrooms are awash with formulaic repetitions (Spina, 2016) of persuasive writing NAPLAN-style. Automated marking may generate data faster, but the quality and usefulness of the data cannot be assumed. Sustained teacher professional learning and capacity building in the teaching of writing – beyond NAPLAN – will be a better investment in the long term. Until then, the major beneficiaries of online marking may be the commercial interests invested in its delivery. Caldwell, D. & White, P. (2017). That’s not a narrative; this is a narrative: NAPLAN and pedagogies of storytelling. Australian Journal of Language and Literacy, 40(1), 16-27. Hogan, A. (2016). NAPLAN and the role of edu-business: New governance, new privatisations and new partnerships in Australian education policy. Australian Educational Researcher, 43(1), 93-110. Lingard, B., Thompson, G. & Sellar, S. (2016). National Testing in schools: An Australian Assessment. London & New York: Routledge. Polesel, J., Rice, S. & Dulfer, N. (2014). The impact of high-stakes testing on curriculum and pedagogy: a teacher perspective from Australia. Journal of Education Policy, 29(5), 640-657. Ragusa, A. & Bousfield, K. (2017). ‘It’s not the test, it’s how it’s used!’ Critical analysis of public response to NAPLAN and MySchool Senate Inquiry. British Journal of Sociology of Education, 38(3), 265-286. Wyatt-Smith, C. & Jackson, C. (2016). NAPLAN data on writing: A picture of accelerating negative change. The Australian Journal of Language and Literacy, 39(3), 233-244. Associate Professor Susanne Gannon is a senior researcher in the School of Education and Centre for Educational Research at Western Sydney University, Australia. One of the advantages of working at Western Sydney University in the School of Education is the opportunity to make a difference both locally and internationally to improving educational practice. 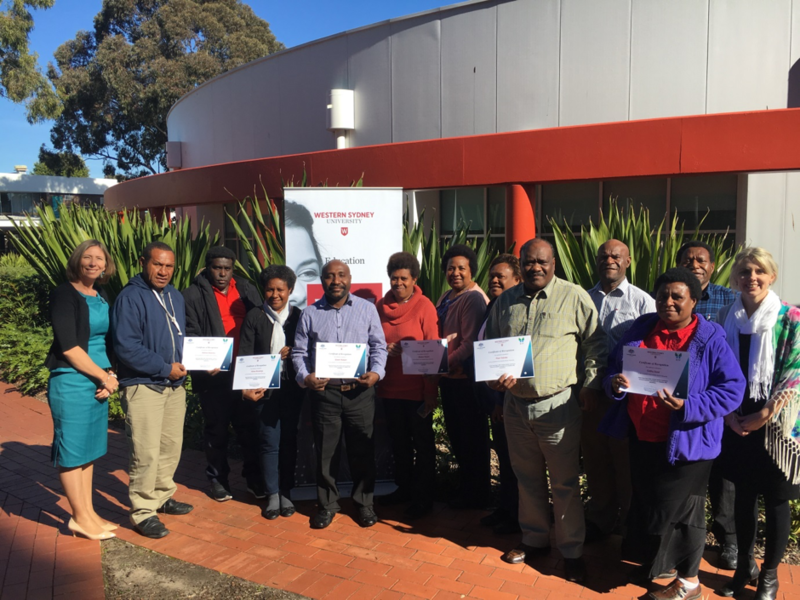 As part of an Australia Awards Fellowship and in partnership with the Kokoda Track Foundation and the Papua New Guinea (PNG) Department of Education, Dr Danielle Tracey and Dr Katrina Barker have been working to develop the capabilities of 10 Fellows working in leadership positions in the Papua New Guinea education system. Their goal, to promote inclusive education within the Teacher College programs and schools across Papua New Guinea. Inclusive education refers to the removal of barriers to education and increased participation of all children in schooling. In the PNG context, less than 2% of children who start Year 1 will continue through to Year 12. The school completion statistics for girls and children with disabilities are significantly worse given they are out of school more than their peers. To help meet the Convention On The Rights Of Persons With Disabilities (CRPD), Papua New Guinea ‘s Universal Basic Education Plan 2010-2019 identifies that Special Education lecturers require professional development to strengthen their training offered at Teacher’s Colleges. This will ensure all children are affirmed the right to an education that advocates inclusiveness. Building the capacity of teachers to include children with disabilities in education will directly assist people with disabilities to participate, find pathways out of poverty and realise their full potential. Australia has made significant advances to policy and practice in inclusive education. At Western Sydney University we have a team of leading academics who teach and research in this field for the purpose of ensuring best practice is translated across education settings. A vehicle which facilitates the driving of best practice is the Master of Inclusive Education. Advancing the quality of life and learning outcomes for individuals with additional needs requires specialists who not only hold the necessary knowledge, but possess skills and dispositions to work in a manner that builds the capacity of individuals with additional needs, their families and those working with them. Drawing upon the expertise of both teaching and researching team members, 10 Papua New Guinea educators visited the School of Education to develop: knowledge and skills in how to structure College programs that include pre-service teachers; observe and critique pedagogy and curriculum used within Australian Universities and schools to promote inclusive education; critique policy and procedures within the education field in PNG; and develop skills in conducting research to support implementing changes following the Fellowship. Danielle and Katrina have been privileged to work with the Fellows to educate them on best practice (universal design for learning and person-centred framework) for inclusive education and facilitate them to develop College and school (context-driven) policies and procedures. A key outcome of this project will be improving teacher educator quality and students’ College course experience and in-service teachers’ professional development courses, with the revitalisation of their inclusive education curriculum, policies and pedagogy. Australia Awards Fellowships funded by the Australian Government build capacity and strengthen partnerships between Australian organisations and partner organisations in eligible developing countries in support of key development and foreign affairs priorities. By providing short-term study, research and professional development opportunities in Australia, mid-career professionals and emerging leaders can tap into Australian expertise, gaining valuable skills and knowledge. Dr Katrina Barker and Dr Danielle Tracey are academics in the School of Education at Western Sydney University, Australia. I have been an educator and teacher, in many forms, working with people of all ages, for many years. I have often reflected on what my core values as a teacher are, because teaching often appears to be a complex and opaque activity, and one can lose sight of what lies at its heart. Yet when you strip away the complexities: the technical and managerial aspects of teaching, the curriculum requirements and the many accountabilities the teacher has, and when you examine what lies at the core, it suddenly becomes very simple – at least, to me it does, much to my surprise. And I think it comes down to this. I want the people whom I am teaching to firstly, respect and value themselves and others; and secondly, to think for themselves and while doing so, to think well. explain their conclusions to, and test them with, other people, and modify their conclusions where they feel they should. Children of school age, I have found over many years, are surprisingly good at developing and maintaining the habits and techniques which enable them to think well. We should, and do through our teaching in schools, continue to build the capacity of our young people to think well. And this brings me to my current concern, and to the point of writing this particular piece. I have been thinking about this now, at this particular time, while observing the current discourse in Australia about marriage equality and the related postal survey voting process that has been promulgated by our government. This is because this discourse, and particularly many of the propositions mounted by the ‘Vote No’ (against marriage equality) case, are examples of thinking at its worst, not its best. The demonstration of poor thinking underpinning the ‘Vote No’ campaign is essentially because, I have realised, the ‘No’ case is running a political campaign on the issue of marriage equality. Rather than engaging in thinking well, the ‘No’ case appears to be attempting to simply misinform or scare the public, mounting spurious or irrelevant propositions, rather than presenting an evidenced-based, logical and accountable case about why marriage equality should not be supported. Unfortunately, political thinking is not usually an exemplar of thinking well. On most occasions political thinking, evidenced by what politicians say and the way they present arguments, is the opposite to thinking well. Political thinking is designed to highlight and privilege one case, to not present or consider alternative cases, and to obfuscate and misinform about relevant arguments, issues and facts. It is to win people over to your side by whatever means it takes, not by the reasonable and transparent means which underpin thinking well. While much of the contemporary general discourse about social issues is politicised, the politicised thinking around them often goes unnoticed by school aged children because it is primarily confined to the parliament. The issue of marriage equality is now not confined to the parliament. Because of the national postal survey and its related campaign, the matter of marriage equality is now public property. It is front and centre in all of our media, and on our devices, on a daily basis. It will continue to be this way for many weeks to come due to the length of the voting process. Our children are watching all of this. And I am appalled by what they might be learning, or un-learning, about thinking well as they observe the current, politicised ‘No’ campaign. Back in the classroom we would call out and challenge the paucity of thinking evident in claims such as: marriage equality should not be supported because it will limit religious freedom; it will lead to more radical forms of personal development curriculum in schools; families need two parents, and parents of different genders, if children are to be brought up well; marriage equality will impede freedom of speech; vote ‘No’ if you don’t like political correctness; vote ‘No’ if you don’t like the way the world is going. These are some of the actual, key arguments currently being advanced by the ‘No’ case in the public domain in relation to marriage equality in Australia. None of these arguments addresses the substantive question being asked of the public. Each one is a red herring, designed to create fear and confusion, and distract from and obscure the simple nature of the substantive matter at hand. Each one is an example of poor argumentation and poor thinking. We would challenge such approaches to thinking and argumentation in the classroom, and we should challenge them now in the public arena. The ‘No’ case, as currently contrived, represents quality of thinking at its very worst. It represents the worst type of role-modelling for our children about how to think well. And because of this, it only helps to undermine the very best of the teaching and learning that occurs in our schools. Steve Wilson is Emeritus Professor at Western Sydney University and an Adjunct Professor in the School of Education at Western. With one short pause he has been editor of this blog, 21st Century Learning, since its creation in 2010, but will step down from this role at the end of 2017. Recently a lesson on the Stolen Generations, conducted at a Sydney school, went horribly wrong. Year 4 students were engaged in a day long ‘role-play’ in which they were told they would be removed from their families. According to reports , a nun entered the classroom in the morning, with a letter from the Prime Minister, and told the class they would be taken away from their parents, as they weren’t being looked after properly. The exercise continued for five hours until the end of the school day when students were informed that this was a lesson on the Stolen Generations, and were asked how it made them feel. While there was extreme concern expressed from the media and parents, Drama teachers all over watched this episode aghast, wondering how such a potentially powerful lesson had gone so wrong. It seems an attempt was made to use the drama conventions of teacher-in-role and role play. These are two strategies found in the beautiful and transformative pedagogy of ‘Process Drama’. Process Drama is a powerful teaching tool when used ethically, but it seems it wasn’t employed carefully in this instance. This lesson seemed much more like ‘invisible theatre’ where the participants did not know that they were in a fictional context or that the teacher was in role. Invisible theatre is more commonly used with adults, whereas Process Drama has a pedagogy of care built in. In Process Drama, students know they are in the drama and in the fiction. Students and the teacher move in and out of role; they don’t play themselves, rather they take on the roles of other people. At the end of a particular strategy or moment in the class, students may need to de-role (get out of role) and discuss and debrief the moments when they were in role. It’s a process students are familiar with. We see small children playing and going in and out of role all the time. When educators use drama in this way, they are protecting their students in role. Through role, we avoid the manipulation of ‘psycho-drama’ and can explore the space where the real world and the fictional world overlaps. The teachers in the school concerned were acting with the best of intentions. They may have seen highly transformative learning experiences, such as Jane Elliot’s Blue Eyes/Brown Eyes experiment and attempted to replicate these lessons. It should be noted that the Blue Eyes/Brown Eyes lesson sparked outrage at the time, but is now considered a watershed moment in addressing racism in schools. However, there are limits to Process Drama’s reach. Process Drama has been critiqued for its attempt to replicate the experiences of disadvantaged people at critical times in history. Can we really ever understand what it’s like to be part of the Stolen Generations, and is it offensive to suggest that we can replicate those experiences? Indigenous children’s writer, Trina Saffioti, whose books were used to inspire the school’s lessons, was deeply uncomfortable with the exercise, stating that it almost cheapens the experience . While it’s true that we can never truly understand what it was like to be a part of the Stolen Generations, the ability to see life from another’s perspective may be the most important lessons that one can ever learn. It is abundantly clear that those facilitating these lessons were ill prepared for the nuances of this delicate teaching strategy. The transformative power of drama is still largely misunderstood in schools. New teachers can have as little as two hours training in Drama in their teacher preparation courses and this is a failure of our system . Many teachers would like to use drama to enhance empathy, challenge students’ worldviews, and to facilitate deep and critical thinking, but often don’t know where to start. If teachers make a misguided attempt, or no attempt at all, we deny our students the opportunity for them to engage with complex issues through an incredibly powerful pedagogy. Lessons that are uncomfortable are not always bad, in fact learning itself is a dangerous act. Students cloaked in safety and shielded from discomfort will not be able to reach their potential, both as learners and active citizens. The Stolen Generations are also a dark part of Australian history which must be recognised by all members of our community if reconciliation is to occur. Students and schools are not exempt from this. Far from being too young, these students are in a prime position to discern racism, prejudice and injustice. The school and Catholic Diocese have bravely said that these lessons will continue, albeit in another form, emphasising that the intentions were sound, but the execution was flawed. We need educators who are risk-takers, willing to tackle big issues, particularly our shameful treatment of indigenous Australians. It would be incredibly sad if this isolated incident prevented teachers from being creative and using drama effectively in their classrooms. Dr Rachael Jacobs is an Arts Education lecturer in the School of Education at Western Sydney University, Australia. Man enough to study Physics? What do New South Wales Physics students say? The proposed Stage 6 Physics curriculum for New South Wales (NSW) has been lauded as a “return to science” and has been welcomed by science-education experts who regard the current curriculum as ‘soft’ and a ‘diluted’ version of physics (Robinson & Armitage, 2017). In her 2017 Australia Day address, Professor Michelle Simmons criticised the “feminisation” of physics in NSW (Fitzpatrick, 2017). The use of the term feminisation refers to efforts whereby curriculum developers sought to make the current physics curriculum more appealing to girls by minimising rigorous mathematical problem-solving and replacing it with a qualitative approach. The new syllabus that will commence in 2018 will move away from this qualitative emphasis and the current ‘social-context’ approach to teaching physics and bring in a greater focus on content and quantitative rigour, including mandatory equation derivations and problem solving (Crook, 2017). Stronger emphasis will be given to learning scientific principles, theories and laws. Topics with a descriptive nature, such as historical linkages and societal implications of scientific inventions will be largely eliminated (Physics Stage 6 Syllabus, 2017). While this has been applauded by critics of the current syllabus and University-based Physics educators, concerns about equity of access have also been raised. The concern is that an increase in quantitative rigour may perhaps lead to even sharper declines in physics enrolment numbers (Crook, 2017). How valid are the perceived beliefs that the ‘dumbing down ‘of physics content by replacing mathematical focus with the life stories of scientists, historical development and societal impacts of their inventions, will appeal more to female students? Are male students naturally better at and inclined to problem solving, experiments and mathematical applications? Such perceptions exacerbate the ubiquitous gender stereotypes regarding the ‘masculinity’ of physics. Results of my study conducted among 247 year 11 physics students (157 males and 90 females) from the Sydney metropolitan area did not support these claims. Male and female students who were continuing physics to Year 12 held high levels of interest value, performance perceptions and instrumental value (usefulness for personal career/study plans) in relation to physics, and there were no statistically significant differences for these values between the genders. Both genders displayed similar levels of high engagement with physics, and held low levels of stereotypes on the perceived masculinity of physics. These observations were equally valid for students who were discontinuing physics, who possessed low levels of interest, performance perceptions and engagement with physics: they also held low stereotypical gender role beliefs. No significant gender differences were found. For the four modules in the current year 11 physics curriculum, in the majority of instances there were no consistent differences in how male and female students perceived the achievement motivational factors explored in the study. When students were asked to rate various Year 11 physics topics based on their interest value, no significant gender difference was identified. Both genders indicated higher than average levels of interest in learning laws of physics, problem solving, experiments, relating to real life situations, contributions to humanity and the abstract nature of physics. However, regarding the much criticized topics such as ‘Lives of Scientists’ and ‘Historical Contexts of Inventions’, both genders displayed a marked lack of interest. This lack of interest was equally expressed by both genders. Likewise, both genders described physics as “interesting, challenging, yet satisfying, and something that relates to everyday life” (male student, comprehensive school). Furthermore, participants’ qualitative responses tended to reinforce traditional views on the expected nature of physics. Students reported that they expected more mathematically oriented content, and ‘crazy calculations to experiments’ (female student, selective school) when they enrolled in senior secondary physics. Nevertheless, the enacted curriculum had ‘too much language orientation’ (male student, selective school). They wanted to see ‘less literacy, more scientific content’ (male student, comprehensive school). In relation to the historical and social contexts of inventions, and descriptive topics like The Cosmic Engine (a topic on Astrophysics), the majority found these ‘boring, dull and not useful’ (male student, Catholic school). Interestingly students gave a strong emphasis to the instrumental value of physics and tended to view the subject as a preparation course of STEM courses at university. The results of my study support the argument that senior secondary physics students may prefer the content and quantitative analytical rigour proposed in the new curriculum and the removal of certain sections in the current curriculum. This endorses the changes prescribed in new Stage 6 Physics syllabus. However, the popular misconception that ‘dumbing-it-down- for- females’ might increase its attractiveness was not supported. Issues around whether the new syllabus may aggravate equity of access to physics will need to be examined once the implementation of the new syllabus begins. Dr Jessy Abraham is a lecturer in Primary science and technology curriculum in the School of Education at Western Sydney University, Australia. © Western Sydney University 2010-2019. Unauthorized use and/or duplication of this material without express and written permission from the Western School of Education is strictly prohibited. Excerpts and links may be used, provided that full and clear credit is given to Western Sydney University with appropriate and specific direction to the original content.